Background: A full crown of the head is a desirable physical feature for some women today. For those women who have a deficiency in the crown area, they commonly try to camouflage it by teasing their hair up but eventually may tire of the effort due to lack of effect or thinning of their hair. In every case of desired crown skull heightening that I have seen a 3D CT scan of the skull demonstrates an obvious slope to the back of head instead of a rounder shape. Thus this desire is not imaginary but has a true skeletal basis for it. While a variety of materials have been used to create such skull augmentations, a custom skull implant provides the most reliable method to achieve it. 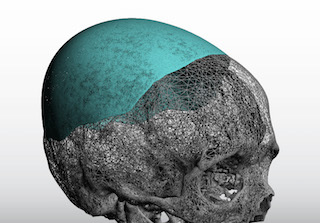 With 3D designing before surgery the desired shape and volume of the skull augmentation is precisely controlled. 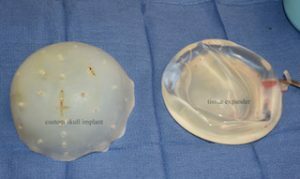 Unlike materials which are shaped during surgery, whose final volume may be controlled by the ability of the scalp to close over it, a custom implant does not suffer from those and other shape issues. 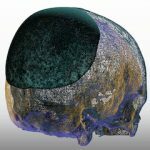 The preoperative volume and shape of a custom skull implant, however, must take into consideration the ability of the scalp to stretch and close ever it. I have observed that when the volume of the implant exceeds 125 to 150ccs and/or the central projection over the crown exceeds 12mms, the need for more scalp coverage comes into play. Case Study: This young thin Caucasian female desired crown of the skull heightening. Computer imaging looked at how much skull augmentation she desired and such changes were felt to require a first stage scalp expansion procedure. Using her 3D CT scan a skull implant design was done that was felt to replicate that type of skull augmentation change. 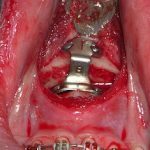 Under general anesthesia a first stage scalp expander was placed which she subsequently expanded on her own to 180ccs over a course of two months. A second procedure under general anesthesia was done in which the scalp spanner was removed and replaced with the designed custom skull implant. The amount of scalp tissue expansion was ideal as the most small lower occipital scalp incision closed over the implant without tension. 1) A projection deficiency of the crown of the skull is the most common reason for females requesting skull augmentation. 2) A custom skull implant for crown heightening is very effective within the limits of the stretch of the scalp. 3) Larger amounts of crown skull augmentation require a first stage scalp expansion.